Instant noodles, mayonnaise and Kool-Aid may not be likely ingredients in a gourmet meal, but if you are in prison, they may constitute the culinary highlight of your day. If your only food intake comes in the form of a small breakfast tray, a lunch tray and a dinner tray, and is designed, as one inmate put it "to be as inedible as possible", some creativity is needed. "In the early '90s, you'd get decent meals, good produce," says Gustavo "Goose" Alvarez, who did two stints in prison, once in the 1990s and once in the 2010s. Between those two stints, state budgets dropped, jail expenses increased, and more communities turned to privatized prisons. Food was one area where administrators looked to cut costs. "Quite frankly, it's disgusting," says Alvarez of the food now. This is where prison cooking comes in, with inmates using any food they can lay their hands on. A common solution: instant ramen noodles. These provide the basis of a "spread": pieces of ramen noodles and spices mixed up a in a rubbish bag or bowl, with any other ingredients available tossed into the mixture. 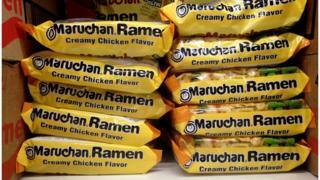 "It's popular in prison because it's an inexpensive, quick meal," says Alvarez, who co-authored a book called Prison Ramen: Recipes and Stories from Behind Bars. "They can pretty much add whatever they want to it and make a good dish." Cooking in a cell is legal, but does require some inventiveness. As a microwave is not available in many places, a bowl of hot water, or even warm water, will do to soak some instant noodles. "You put your noodles in this, add hot water, put the lid on, and then take it to your bunk and cover with bedding and pillow to hold in the heat. This method is usually pretty effective, and after 10 minutes or so you have your ramen," writes one ex-convict on WikiHow. A bowl, he says, is usually available from the prison canteen. But a rubbish bag may be used to soak food as well, and even toilet paper has been used in prison cooking. Ingredients such as canned tuna, bread, rice, or cheese-flavoured cornmeal snacks can be purchased at the canteen for those inmates who have money on their accounts. Others may try to save anything from breakfast or lunch, for example a boiled egg, a roll, some mayonnaise packets, or a pickle. Alvarez says that the choicest ingredients do require some rule-breaking, like sneaking plastic bags of an unappealing meal out of the mess hall in order to pick out morsels of meat. "You'll sneak back bits of beef stroganoff and wash it off, mix it in with your ramen and create a different dish," he explains. He says that if you get caught, an understanding guard will simply throw your stash away. A more serious infraction occurs if an inmate gets caught with fruits, or a stash of sugar-rich foods - a telltale sign the person is trying to brew some "jailhouse hooch". Crush the Ramen in the wrapper and empty into a large bowl. Save the seasoning packet for another use. Add the water, cover, and let sit for 8 minutes. Drain off excess water. Add the rice and stir well. Set aside. Pour the Kool-Aid into a large microwavable bowl and add a tablespoon or two of hot water. Stir until it has a syrupy consistency. Toss a handful of pork skins into the syrup and stir. Repeat until all pork skins are coated. Cover and microwave the pork skins for about 5 minutes, until they puff. Serve the pork skins on top of the Ramen and rice. Note: For spicier flavour, try a dash of hot sauce on top of the porkies. The dishes cooked in prison have sparked an explosion in recipe collections, and are shared on social media. The Convict Cookbook is a collection of recipes from prisoners at the Washington State Penitentiary in Walla Walla, Washington. The Jailhouse Cookbook: The Prisoner's Recipe Bible is an upmarket collection of recipes written by a chef-turned-convict. From The Big House To Your House: Cooking in Prison has 200 "easy to prepare" recipes written by inmates at a woman's prison in Gatesville, Texas, and is also aimed at cooks outside prison with limited resources. Apart from tastier food in larger quantities, cooking in prison provides inmates with a focal point and a social opportunity to be creative. For many, it is also about the memories of cooking in better times. Karla Diaz is a performance artists who has worked with inmates and collected recipes ranging from traditional Mexican soup made with chilli lime-flavoured corn nuts to pork rinds with jelly. "Cooking meals in prison isn't really about the taste," she tells Vice News. "It's a reminder of humanity, community, and the person you were on the outside." Alvarez says he still eats ramen. Just the other day he took a break from writing to whip up some noodles with smoked oysters, chopped onions and coriander. He says the smell still brings him back to his prison days, which he calls a "bittersweet" experience. "I was making chicken soup - it took me right back to that ordeal," he says. "I felt how I felt at the time - I was on my own, becoming a man, but in prison. It was an eerie feeling - that little warm soup brought me some comfort. There is still something I can have and feel at home, even though I'm not."